It seems like we just celebrated the 60th anniversary of Disneyland Resort just a little bit ago, but believe it or not the 60th was already 2 years ago! Each year Disneyland celebrates its birthday is another year of magic and fun to be celebrated, so I wanted to create a DIY craft perfect for Disney lovers, and as a nod to the vintage Disneyland map. 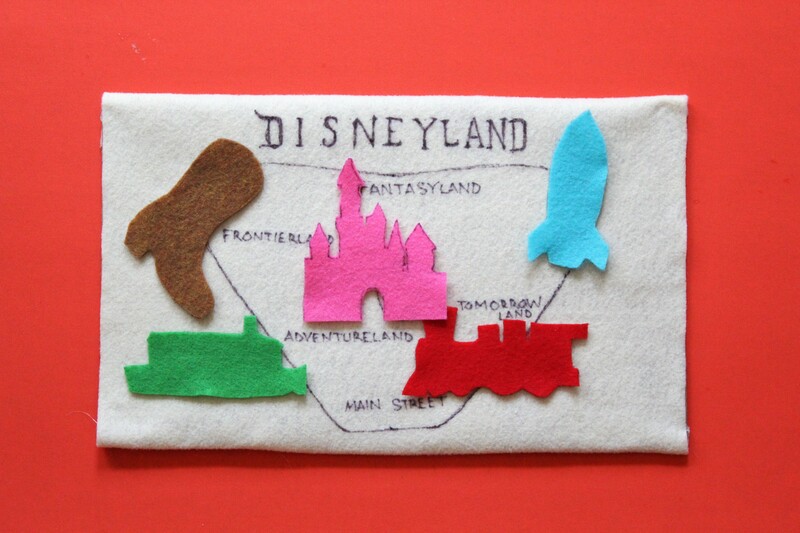 I created a DIY and print out template to make your own Disneyland vintage map felt board, perfect for a gift or a baby shower or birthday, as a toy for a plane ride to Disney, or to make for your own child just for fun! Print out template, which you can find here. Print out the map shapes template. Cut out each of the pieces. Glue an off-white piece of felt onto your cardboard. On the off-white felt, use a black permanent marker or fabric marker to write the word “Disneyland” at the top, then draw a rounded-edge upside down triangle on your felt. Write the words Fantasyland, Tomorrowland, Main Street, Adventureland, and Frontierland in the corresponding spots on your map. Use your paper shapes to trace onto your pieces of brightly colored felt. (Green for Adventureland, brown for Frontierland, red for Main Street, pink for Fantasyland, and blue for Tomorrowland). One traced, cut out your felt pieces. Your board is now complete! Have fun playing with your little Disney fan in training to help them match the pieces to where they belong on the map!